More than a dozen fellow Nobel laureates have criticised Aung San Suu Kyi, Myanmar’s de facto leader, for a bloody military crackdown on minority Rohingya people, warning of a tragedy “amounting to ethnic cleansing and crimes against humanity”. The open letter to the UN security council from a group of 23 activists, including Archbishop Desmond Tutu and Malala Yousafzai, warned that the army offensive had killed of hundreds of people, including children, and left women raped, houses burned and many civilians arbitrarily arrested. It was delivered as Bangladesh announced around 50,000 Rohingya Muslims have fled the violence across its border. “Access for humanitarian aid organisations has been almost completely denied, creating an appalling humanitarian crisis in an area already extremely poor,” reads the letter, whose signatories include current and former political and business leaders and campaigners such as Yousafzai, the youngest winner of the Nobel peace prize. “Some international experts have warned of the potential for genocide. It has all the hallmarks of recent past tragedies – Rwanda, Darfur, Bosnia, Kosovo,” the letter reads. The recent bloodshed is the most deadly since hundreds were killed in clashes in 2012 and more than 100,000 were forced into squalid camps. An Amnesty International report this month, based on extensive interviews with Rohingya as well as analysis of satellite imagery, claimed that actions by Myanmar’s military may constitute crimes against humanity. Aung San Suu Kyi, who spent much of the past two decades under house arrest and was awarded the 1991 Nobel peace prize, won elections last November, ending decades of junta rule. But the Myanmar armed forces, or Tatmadaw, retain significant power in Myanmar. Under the army-drafted constitution, the military controls the three most powerful government ministries: home, defence and border affairs. Aung San Suu Kyi is foreign minister and state counsellor, as the law bars her from the presidency, which is held by her close aide Htin Kyaw. However, she is widely considered the country’s de facto leader. Nobel peace laureates who signed the letter include Jose Ramos-Horta, former president of East Timor, and Yemeni opposition activist Tawakul Karman. It was also signed by former prime minister of Italy Romano Prodi and British business leader Sir Richard Branson. Bangladesh has stepped up patrols to try to stop refugees crossing the border during the last three months, and its foreign ministry had summoned Myanmar’s ambassador to express “deep concern at the continued influx”. “Around 50,000 Myanmar citizens took shelter into Bangladesh since 9 October 2016,” the foreign ministry said in a statement on Thursday. A spokesman for the United Nations high commissioner for refugees told AFP that at least 43,000 Rohingya have taken shelter in Bangladesh since October. Earlier this year, NASA astronaut Jeff Williams captured ultra high definition video of our pale blue dot from the vantage point of the International Space Station. It’s easily the most uplifting thing you’re going to see all day. In this newly released video, Williams talks about what it’s like to gaze upon the Earth when in space, and why it’s important to share this unique perspective with others. It’s been said many times that a person’s perspective on life, the universe, and everything changes after seeing our planet floating in space. Watching this video, it’s easy to understand why. NASA has made these video files available for download, which you can access here. GPO Complex, INA, New Delhi. Sub: Unlawful Arrest of 7 members of a Fact Finding Team of Lawyers, Journalist, Human Rights Activists, Students of Telangana on 25th Dec, 2016 and Continuing Repression of Adivasis, Activists, Lawyers, Human rights workers in Chhattisgarh. This Hon’ble Commission and the entire country is well-aware of the serious constitutional, legal and human rights violations that have sadly become a part of the everyday reality of the adivasis and human rights activists in the villages and forests of South Chhattisgarh. In the name of ‘combing’ and combating ‘Maosim’, the State, through its military, para-military, security and police forces has unleashed an unprecedented spree of threats, violence, false cases, arbitrary arrests, detentions, dubious encounters, rapes, sexual assault etc. on the impoverished adivasis and anyone who stands up for their rights. A very large number of fact finding reports and the National ST Commission Report have brought forth these realities very vividly. A testimony to this well-documented state of affairs is the recent Order of this Hon’ble Commission dt. 17/12/2006 summoning the Chief Secretary of Chhattisgarh and Mr. SRP Kalluri, IGP, Bastar Range, who is widely believed to be responsible for a lot of extra-constitutional actions and has also been indicted by the CBI in the Tadmetla incident. However, citing ‘health reasons’, barely a few days before he was to appear before this Commission, the said IGP stayed away from the hearing and is now ‘back to work’, with what seems yet another attempt to officially tarnish democratic processes and harass human right activists. It is in the above context that we would like to draw your immediate attention to the recent arbitrary arrests of a fact-finding team of 7 members from Telangana Democratic Front (TDF) comprising High Court lawyers, human rights activists, students and a journalist by the Telangana and Chhattisgarh Police, violating due process of law. In its press release dt. 26/12/2016, the district police of Sukma, Chhattisgarh has gone so far as to brand all these 7 persons as ‘naxalites’, without even caring to refer to any evidence, to level such an allegation. [Annexure-II]. 2.Chikkudu Prabhaker, Advocate, High Court, AP and Telangana and Convenor, Telanagna Democratic Forum. 7. Ramanala Laxmaiyya, Secretary, Adivasi Tudem Dubba, Khammam. We would like this Hon’ble Commission to kindly note that, reportedly, all the 7 members were picked up in the day on 25th December, 2016 at Dummagudam village, Bhadrachalam District, Telangana, when they were planning to visit Chhattisgarh to enquire into complaints of human rights violations suffered by adivasis villagers at the hands of security forces. Later in the evening, the Telangana police handed them over to the Chhattisgarh police, where reportedly they have been charged of various offences including possessing ‘banned’ literature and banned currency notes, providing ‘assistance’ to Naxals, ‘instigating’ adivasis against the state/police etc. An FIR was registered under the Chhattisgarh Public Security Act (CSPA), 2005 by the Sukma police. On 26/12/2016, all the 7 accused persons were produced before the remanding Court in Sukma and remanded to judicial custody under sections 8(1), (2) and (3) of the CSPA. It has come to our notice that while the arrest was actually made by the Telangana police within the territory of Telangana, the Chhattisgarh police misinformed the magistrate that the 7 persons were arrested in Chhattisgarh and have stated so in their official press release referred to above. The said act of misleading the Court, is an offence in itself and a blatant abuse of law since all the 7 persons who were arrested by the Telangana police within the territory of Telangana had to be produced before an appropriate Telanagana Court having jurisdiction and not before the Chhattisgarh Court. This apart, there appears to be no prima facie reason for the arrest itself, even within Telanagana. This entire episode is undeniably yet another act of state vendetta and a glaring example of gross abuse of public office, criminal defamation and violation of the civil liberties and human rights of these independent investigators. The arrest, we submit, is totally unlawful, unwarranted and violative of the numerous orders issued by the Hon’ble Supreme Court in the past and ‘arrest’ regulations by this Commission too. The members of the fact-finding team are respectable, law-abiding citizens including lawyers of the High Court, journalists and human rights activists. There was no need for the arbitrary arrest or even denial of bail the ‘judicial custody’, since there is no reason to believe that they would evade judicial process or subvert the trial /prosecution. As has been stated by various civil rights groups, this is clearly a case of both Telangana and Chhattisgarh police overstepping their mandate and “violating the law and the fundamental rights to free movement, freedom of speech and expression and the fundamental duty to protect the fundamental rights of adivasis and other local people in Bastar area who are victims of a severely repressive state police”. It is in fact the duty of law enforcement agencies to ensure the security of human rights defenders who are assisting the State in ensuring rule of law. But what we are witnessing in these parts of Bastar is a complete breakdown of rule of law and sustained persecution of anyone and everyone who questions human rights violations. We would, at this point, like this Hon’ble Commission to note there is a clear history of impunity enjoyed by the police in this region and the overt and covert support that the state apparatus gives, at the highest levels, has led to the situation we are in today, where police think they are ‘above the law’ and ‘accountable to none’. While the general situation inside Bastar is now widely known, there are a very large number of specific instances of extra-judicial killings, disappearances, police violence, sexual assault cases etc. that have still not come to the lime light and even FIRs are not being registered. It is these specific instances that the State is keen to suppress under the unacceptable alibi that it would “weaken the morale of the forces”! The alleged torture and encounter of a minor, Somaru Pottam from Metapal village in mid-December by the security forces, in which the Bilaspur High Court has ordered a repeat autopsy two days back is only one of many such likely incidents. There is also a continuous threat climate that is being created i.e. no academics, lawyers, journalists, activists or the adivasis should dare question anything that the police do in the name of fighting the Maoists. Very recently rights advocates, activists associated with PUCL and JAGLAG were intimidated for calling a meeting of the adivasis in Matenar village of Dantewada and hearing their grievances (despite due police permissions in advance). Yesterday, Adv. Shanili Gera and other legal activists were harassed by the SP Bastar, Mr. RN Dash at Jagdalpur, despite the fact that were there as per Orders of the High Court and arrangement of the Police Commissioner, Bastar, for exhumation of the body of Somaru Pottam, alleged to be encountered. Detailed complaints in this regard have already been sent to the Commission. All these instances of human rights defenders is totally unconstitutional and require immediate attention. 1. Drop all charges against all the seven members of the Fact Finding Team of TDF and ensure their right to freely move in the areas of Bastar for conducting a fact-finding. 2. Initiate criminal prosecution against the concerned police officers for abuse of due process law, reportedly misleading the Sukma Court and arbitrarily arresting the fact-finding team members. 1.Summon Mr. SRP Kalluri, IGP, Bastar Division and Mr. RN Dash, SP, Bastar before the Commission in person to offer a detailed explanation of all charges of human rights violations against them and thereupon initiate appropriate action, as per law. 2. Send a high-level team comprising some members of this Commission and some independent activists, lawyers, academics and journalists to visit various areas in the Bastar region and obtain first hand information of the serious issues of gross human rights abuses, to enable quick and appropriate action as per law. 3. Direct filing of FIRs in all cases of cognizable offences and human rights violations as directed by a 5-judge Constitution Bench of the Hon’ble Supreme Court, headed by the CJI in Lalita Kumari vs. Govt. of U.P. & Ors [(2014) 2 SCC 1] (wherein it was held that registration of FIR is mandatory u/Sec 154 of IPC if information discloses commission of a cognizable offence). Adv. MA Shakeel, Centre for Study of Constitution and Society, Hyderabad Telangana. S.Q. Masood, Centre for Peace Studies, Hyderabad Telangana. Malini Subramaniam, Independent Journalist, Hyderabad. Macca Colony, Hyderabad - 053. As the deflationary spiral deepens rapidly across vast swathes of India's cash-dependent informal economy, ultimately impacting the formal sector too, what was seductively sold to the public as a "surgical strike" on black money may turn out to become the worst-ever carpet-bombing the country's economy has ever experienced at the hands of its own government. In any case, a militarised imagination is the last thing India needs to face its real problems today. We are in the hands of a digital-romancing political fantasist of extraordinary unrealism, gambling with the real lives of unsuspecting millions across the country. He makes the adventurous Tughlaq seem sane by comparison. The currency is the centrepiece of a modern economy, the trust and credibility reposed in it being one of the most precious of national assets. It is not to be trifled with by ignorant tyrants. And this is why fiscal and monetary powers are separated in any modern economy, and the autonomy of the central bank is sacrosanct. This separation of powers is analogous to the political separation of powers between the executive, the legislature and the judiciary. So, for the government to supersede the RBI and take direct charge of the currency is almost like the executive branch assuming, in addition, legislative and judicial powers. Many economists, otherwise as divergent in their views as Larry Summers and Amartya Sen, have noted that there may be few parallels in the modern world to the sheer temerity with which the executive branch of the Indian state arrogated monetary authority to itself on 8 November. It made a mockery of time-honoured norms of public trust and central bank autonomy, responsible in no small measure for the reputation for financial wisdom that the RBI had hitherto assiduously earned over the course of its eight decades of existence. RAISING DOUBTS: Now everybody will doubt the Reserve Bank and the reliability of the Rupee. (Over $6 billion in foreign funds have already left the country since 8 November, at least in some measure due to demonetisation). Many are rightly asking questions of the legality of this extraordinary act of monetary default on the part of the State. Others have questioned the 'sanity' of the move. Any competent undergraduate student of Economics from the University of Delhi could have forewarned the PM that a monetary contraction of 86% in liquid cash was bound to paralyse the economy for an indefinite period of time. It is like an RBI announcement of a sudden, unsuspected hike in the rate of interest of 100-200 basis points. The business press would have been enraged. WHAT IS REALLY THE END GAME? : To cleanse the only village well of pollutants, you cannot possibly think of draining it out completely and then reintroducing the water (especially when you live in a dry area without rain, lakes or rivers to replenish the water in the well). If the pollutants become such a nuisance, you have to find intelligent ways of reducing them, without removing the water. This wisdom deserted the PM, especially since the political temptation of busting the treasure-chests of political opponents (while pre-emptively guarding their own) in upcoming elections in UP, Punjab and Gujarat appears to have prevailed. In the event, as the deflationary spiral deepens rapidly across vast swathes of India's cash-dependent informal economy, ultimately impacting the formal sector too, what was seductively sold to the public as a "surgical strike" on black money may turn out to become the worst-ever carpet-bombing the country's economy has ever experienced at the hands of its own government. In any case, a militarised imagination is the last thing India needs to face its real problems today. AN EXERCISE IN DESTRUCTIVE FUTILITY: The government's hope has been that about Rs 3 to 4 lakh crore of the demonetised cash will not return to the banking system, implying that this would be the sum of isolated black money. The RBI's liabilities would go down by the same amount, yielding the government an equivalent dividend. The government could then deposit Rs 10,000 into each of the 250 million Jan Dhan accounts, yielding people an election year bonanza (the mopped up black money), while still leaving a substantial sum for infrastructural spending to revive a sagging economy. But what if it turns out by 30 December that all the Rs 15.5 lakh crore of demonetised currency has returned to the banking system? If so, Modi's gamble would have boomeranged. The government's black money narrative would have failed altogether. In order to somehow redeem demonetisation, the government has of late also been heard saying that new bank deposits may not necessarily be 'white'. Any unaccounted money that has been deposited into bank accounts during the last month will be taxed at 50%. At least some of the people who voted for Modi should also prepare for income tax raids - for the government's moves on black money cannot be seen to have been an outright failure. WHERE IS THE MONEY? : Meanwhile, given the massive gap between the daily volume of cash needed at the bank branches and each of the 2,00,000-odd ATMs across the country and the rate at which new currency is actually being produced at the country's four mints (despite extra shifts), the queues in front of the ATMs are not vanishing any time soon. Scores of people have died directly on account of the cash crunch and the marriage season has been rudely interrupted across the country. The country's vast informal economy is living from hand to mouth and facing the bitter winter cold. Given the terrible timing of demonetisation - in the cusp between the Kharif harvest and the planting of the Rabi crop - agriculture has been thrown into complete disarray. Sowing in large parts of rural India stands severely interrupted, because cash-dependent farmers have often not been able to sell the produce from the last harvest. Migrant workers in areas like Punjab and Gujarat have returned to their home states, for the want of work. Prices of all perishable produce have fallen dismally low because of demand having vanished from the market. At the next harvest, at the beginning of summer, the overall agricultural output is likely to be well below normal. Ironically, this will happen at a time when the days of cash rationing would be close to getting over and the greater access to cash will expectedly lead to a spurt in public demand. Given the recent persistent context of uncertainty, there is likely to be plenty of hoarding on all sides. It is thus a safe bet that food prices will rise sharply over next summer. COLLAPSING MARKETS: Cash-driven urban wholesale markets for agricultural products, poultry and fisheries have all but collapsed. Small traders are in deep water. The millions engaged in the wholesale trade are out of work. Porters and cart-pullers at such markets are losing their daily wages. Other areas of the informal economy are suffering badly as well. Micro, small and medium enterprises in the manufacturing sector - involved in textiles, leather goods, brassware, glass, and a whole range of other products - have all but collapsed. Employers are unable to pay their workers, often on a daily wage contract. They are also not able to procure raw materials in many cases and sell their output. Towns like Coimbatore and Tirupur in the South and Surat, Agra, Moradabad and Ludhiana in the North have ground to a virtual standstill because of the cash crunch. The cascading effects on the formal sector are also beginning to show, as the data comes in from the construction, automobile and two-wheeler industries. The outlook for at least the next two quarters looks utterly bleak. It is still very early to estimate in monetary terms the damage to the economy over the medium term. However, even the RBI has scaled down the GDP forecast for next year from 7.6% to 7.1%. Others expect a greater impact. ANYTHING GOOD? : The only areas of the economy doing well at the moment are those directly involved in the vainglorious project to make India cashless. Paytm's fortunes have touched a new high of over 5 million transactions a day, yielding it a record Rs 400 crores of revenue in a month. Appropriately, Modi himself appears in one of the recent promotional ads for the company. The overall picture at the moment appears to be that while demonetisation has had very high short-term costs, its putative long-term gains, if any, are utterly dubious. Most of black money - much of it hiding in digital space - has remained outside its reach. The part of the black money circuit which uses the high denomination notes to grease its transactions is likely to resume once this fever settles down. The new Rs 2000 currency note does not help matters. If it has quartered or halved the speed of replacement of the old notes of Rs 500 and Rs 1000 it has been replacing, it has also quartered or halved the storage space that large wads of vagrant cash consume. Among other things, demonetisation is also being defended as a necessary step towards the formalisation of the economy. The argument that the formalisation of the informal economy will necessarily be in the country's long-term interest itself needs to be given a close scrutiny. Elites typically misread their societies. Indian metropolitan elites have never had a very good recognition and understanding of the unmeasured/mismeasured wealth of rural India. It is sobering to keep in view the fact that this is a country that routinely rewards its food critics on scale orders of magnitude above how it values its food producers - who is ever keen to sell down the river so that global agribusinesses can carve out their markets here. It is often heard that formalisation will draw a greater volume of savings into the mainstream economy. This is touted as one of the merits of going cashless. However, it is worth inquiring as to whether investment is being inhibited by a shortfall in savings, or whether the real cause lies in the growing inequality of incomes, which adversely affects effective demand in the macroeconomy. In closing, one may recall the obvious and reflect upon the wisdom of seeking to eradicate cash from a country where most people have barely begun to learn how to operate a bank account and a smart phone, let alone acquire the requisite financial literacy and digital comfort with handling money in non-physical, abstract terms. It is also important for an awakened citizenry of a democratic country to consider if good governance is equivalent to totalitarian control of the country's currency by an ignorant leader who has exercised an ambition out of all proportion to legitimate, even practical, force. We are in the hands of a digital-romancing political fantasist of extraordinary unrealism, gambling with the real lives of unsuspecting millions across the country. He makes the adventurous Tughlaq seem sane by comparison. Will he survive the electoral test? Only coming months will tell. Neither the Ambanis nor the Adanis would be bothered, but I and others in the small sector have started to breathe harder. It is as if the prime minister has deep hatred for all businessmen other than big corporate giants. It is as if we are being strangulated, ever so slowly, all because Modi wants to win a few of the Assembly elections.. ...Honest suffer, dishonest smile: In the last week of November, the virus of panic has afflicted the industry. But the virus, ironically, has debilitated those in the organised sector, that is, those who follow legitimate business practices and pay taxes. They are people like me whose business is above board. I discern a trend – those gripped by the panic-fever in the immediate aftermath of demonetisation have been cured of their malaise. They look relieved, they have converted their old notes into new. More significantly, they have orders for the next season. How? What distributors have done, I am told, is to parcel out their cash reserves in old currency notes to different players. So, for instance, distributor X pays Rs 1 lakh to producer Y. It is an order for electric fans totalling Rs 70,000 – the Rs 30,000 deducted as Y will have to take a 30% hair-cut for converting the old notes into new. It is for Y to decide whether to begin production. As I pointed out earlier, he might not soon, preferring to wait to see which way the war on black money will go, whether he needs to place his business operations above board. My sense is that we have such a large unorganised sector that it is impossible for the government to go around cracking the whip all over India. Nevertheless, whatever Y’s decision, he has the orders and money to undertake production at a time of his choosing. I barely have orders. I don’t have cash. Worse, I can withdraw from my current account just Rs 50,000 a week, peanuts for the range of my business operations. I can see the failings of demonetisation – it hasn’t flushed out black money from the economy, and the dishonest have stolen a head-start over me. December, the cruelest month: Salary day has arrived. We generate a fair volume of scrap, which we sell every year and utilise the money for productive purposes. But not this year. The money from the sale of scrap is distributed as salary to employees. Mind you, I can’t retrench workers, not necessarily because they have been with me for years, but I would be squeezing my resources to pay them gratuity and termination benefits. It serves no purpose to now provide a weekly account to you, because nothing has changed other than the depth of my desperation. I call our few distributors. They say they haven’t received money from dealers, who claim retailers haven’t paid them yet. Everybody has pushed their payment schedule farther into the future. Worse, everybody has chosen to postpone expenditure. I went to a restaurant with my family and found it deserted. Better to eat dal-roti at home than splurge money on dishes you don’t cook at home. I figure out the implications for my business while tucking into kababs. Boss, let’s face it, fans are not a necessity, you don’t die because of perspiration. Distributors and dealers know this mundane truth. They can’t predict for how long consumers will persist with their parsimonious ways. Why should they then risk advances to order fans when they can’t predict the demand for it next March-April? Some statistics now: I have received just 15% of orders that I had in November-December last year. The poet TS Eliot wrote, “April is the cruelest month…” In India, it is December in 2016, it will be recorded in business history, when cash simply refused to flow. No threats, Mr Prime Minster: In December, raids to unearth undisclosed income have increased. They have been shown on TV to prove to the nation that the government intends to root out black money. The salaried class cheers Modi, as also those in the low-income category, unaware that they are next in line to be hit hard. How, you wonder. Let me tell you straight: these raids, and the prime minister’s daily warnings that demonetisation is the first step to root out corruption, have businessmen playing statue-statue. Remember that game we played as kids. You uttered statue to someone and he was supposed to freeze, until you called out over. Modi’s threats are having the same effect on businessmen engaged in industrial production. And it will throw people out of jobs. Don’t think I am against targeting the corrupt. But, really, it is a cruel irony to see tax authorities raiding businessmen. I mean, come on, who doesn’t know they are among the most corrupt in India – they extort money from businessmen by adopting menacing tactics, for instance, by accusing us of concealing excise or sales tax in case we refuse to grease their palms. These tax authorities must be licking their lips in anticipation. Because of the palpable economic slowdown, the government income through taxes must have reduced drastically. Assume I had to file value-added tax in October and I didn’t. They will issue notices to me saying pay the dues. Ordinarily, such notices have us request the authorities for an extension. The pressure on them to report higher revenue will goad them into squeezing us hard. “Please sir,” we will moan and offer them bribes. After all, I wouldn’t want to pay lakhs when the business mood is palpably downbeat. Better to pay the tax guy an infinitely smaller amount. As December 30 draws near and all inconveniences are supposed to miraculously end by then, I am not too hopeful about the economy. I hope the limit on cash withdrawals will end. I hope I can withdraw as much as I need for my business. The pain, otherwise, will shatter our endurance. I can’t access my deposits but big corporations will take recourse to loans transferred to them digitally. I don’t know what intentions the prime minister had, whether noble or ignoble. But, right now, all the big talk about rooting out corruption and the spectre of more raids and heightened surveillance seems to have thrown India’s economy into disarray. Did Amit Shah's bank in Gujarat receive Rs 500 crore soon after note ban? The young man was taken aback, but agreed to the challenge and taking the bowl, spent the whole day painstakingly circling the palace until he was once again at Janaka’s presence. Humbled, the young man bowed to Janaka and left, having found his answer. I like this story for all sorts of reasons, not least because I read it first in an Amar Chitra Katha comic when I was a child. And yet, its “truth” is a complex one, and not something that can be understood by reaching for “facts”. We have some textual ‘proof’ from the late Vedic texts that Videha might have existed and at least one king named Janaka ruled it, beyond that – whether he was a sage, or a good king, or ever had a conversation with a monk who questioned his saintliness is beyond the ability of anybody to verify. As for me, I read it in a comic book. If we are to dismiss every story for which we have no verifiable evidence we would be left with a world without meaning. In his enormously ambitious and hugely successful science fiction novel, Embassytown, China Mieville posits a race that can only speak about facts. If they have to talk about a rock that is broken and joined up again, they have to break a rock and join it up again. They have no access to similes, metaphors, or stories that are not based on verifiable evidence. In their interaction with humanity as non-facts breach their communication (and Mieville has an excellent, sly metaphor of the breakdown of double-checking) their language drives them drunk, insane even, laying waste to their civilisation. But there is a deeper question of what kind of civilisation would be built purely on “verifiable evidence” in the first place. The great fact of the universe is that humans are entirely inconsequential. Given the scale – in terms both of time and size – the earth is less important to the observed universe as a grain of sand brushing against the side of a whale. As it is, speaking of scale is itself deceptive. What happens at our scale – that of humans on a solid world – is really not where the action is. As the theoretical physicist Brian Greene argues in his, The Fabric of the Cosmos, our senses have led us astray. Because we are the size we are, we perceive a relative stable universe, but this is not the reality at sub-atomic levels, or at the time and scales which planets or other galactic bodies such as stars and comets inhabit. To judge the universe from a human perspective is nonsense. While many of the scientific discoveries that allow us to understand some of this reality – and our very marginal part in it – have been made in the last couple of centuries, the first hominids that walked the African savannah hunting and gathering in the wake of more powerful and better equipped animals would have understood the feeling of irrelevance very well. The stories that humans use to make sense of the universe are not derived from the facts of the universe, but conversely for what they desire from it: aspects such as compassion, justice and fairness and a special place for humans. The late Terry Pratchett, who had little use for religion in his own life, populated his famous Discworld novels with religious fables, none more so than Reaper Man and Small Gods, but possibly his most full throated support of the power of belief is found in a conversation between the character of Death (enunciated in capital letters) and Susan in the novel Hogfather. While Pratchett described the unprovable hypotheses that underpin stories as “lies” – big or small – the late Stephen Jay Gould, evolutionary biologist and palaeontologist, famously referred to the truths of religion and truths of science as two “non-overlapping magisteria”, which were focussed on seeking truths that did not overlap with each other. The current Pope, Francis, a man who has been a scientist in his own life, has spoken in favour of scientific theories such as evolution and that God is not somebody with “a magic wand”. As such, he seems to share Gould’s point of view, but given the Catholic Church’s long struggle to accept such ideas, it seems too easy to say that this was – and will be – always so. While the current Dalai Lama, Tenzin Gyatso, has declared that beliefs incompatible with science should be shunned, his own position is based on the belief that he is the 14th in a line of reincarnations – not a belief that can be verified by science. As 2016 draws to an end, we put behind a year marked by large global populations believing in ideas that are not based on verifiable evidence – whether they be that killing fellow men will guarantee a place for you in God’s grace or that an orange-faced buffoon with a history of bankruptcy and dishonest dealings will make America “great again”. We do not truly understand why people believe what it is that they believe, but the stories that they tell themselves give meaning to their lives, and they will not let them go lightly. Fact-checking, or expertise in a particular field, may not be enough to confront the force of these ideas. Instead, if we are disheartened by the visions evoked by a host of political actors that seem to have stormed on to the world stage, our challenge will be to create stories of meaning, to define what a “good” life is, why some purposes are more “noble” or of greater “worth” than others. This requires a politics of meaning, not merely a politics of technocratic skill. The open question is does the liberal world order have such stories, and if so, can it tell them in a compelling enough manner to enchant, persuade and motivate people to defend it, and build upon its achievements? This is the contest that now takes centre-stage, and those with the best stories may, quite literally, be the ones who will have the final words. Hopefully they will not be “The End”. The scene was hardly conducive to romance. She was a sick Iraqi in a wave of refugees trying to enter Serbia, while he belonged to the stern Macedonian police force keeping guard. But Noora Arkavazi, a Kurdish Muslim, and Orthodox Christian Bobi Dodevski quickly fell in love after they met at the muddy border in early March -- and celebrated their wedding four months later. Bobi recalls the rainy day he first saw Noora in no man’s land between the two Balkan countries, when he was working only by chance after swapping shifts with a colleague. “It was destiny,” the affable 35-year-old tells AFP over tea in his small apartment in the northern Macedonian town of Kumanovo, where he now lives happily with his young wife. Noora, 20, hails from Diyala, an eastern province plagued with violence in the Iraqi conflict. She says at one point Islamic State jihadists kidnapped her father, an engineer, and demanded thousands of dollars for his return. Early in 2016, Noora and her brother, sister and parents abandoned their home and began a long journey west, crossing the border into Turkey, taking a boat to the Greek island of Lesbos and eventually entering Macedonia. ‘Just don’t worry’: When she first met Bobi, Noora had a high fever and was desperate to know if her family could cross the border into Serbia. Balkan countries had just begun closing their doors to migrants, so the fate of those transiting through Macedonia was unclear. The other police officers all directed her to Bobi because he spoke good English, and he made sure she and her frail mother were taken care of with medical aid and blankets. “He said just don’t worry, everything will be very good in your life,” Noora remembers, now laughing over the fact that he couldn’t stop looking at her. Twice-divorced Bobi says he knew he had found someone special. “When I saw Noora for the first time, I saw something good in her eyes.” In the coming days, while the migrants waited in limbo in the Tabanovce transit camp, Bobi and Noora spent more time together -- he would take her and her mother to local markets to buy food and clothes. Noora, who speaks six languages and began helping the local Red Cross, liked the way the tall policeman would play with the migrants’ children, unlike some of his more serious colleagues. The Macedonian force has faced criticism for its treatment of migrants, particularly for firing tear gas at some of those trying to cross the border from Greece. The proposal: One evening in April, Bobi invited Noora to a restaurant, where she recalls him being extremely nervous, drinking lots of water and shaking. Then he suddenly proposed. “I told him no, you are joking... but maybe ten times he repeated this, ‘will you marry me?’.” Noora eventually said yes, but she worried about her parents’ reaction to her marrying a non-Muslim. She told them: “I chose a good man for my life and I will marry him. I don’t want to marry another guy”. But they were “so nervous and angry,” she says. Noora is reluctant to talk about her family now, except to say she is relieved that they are living safely in Germany. ‘A beautiful wedding’: Noora and Bobi celebrated their wedding in Kumanovo on July 13, her birthday, in front of 120 guests of “every religion”, including her Red Cross colleagues. The town is one of Macedonia’s most ethnically mixed, with Muslim Albanians, Serbs, Roma, Turks and other groups as well as the ethnic Macedonian majority. “It was a very beautiful and fun wedding,” says Noora, describing the live music and dancing that continued into the early hours. The couple now live with Bobi’s three children from previous marriages, and Noora is expecting their first baby. As a sign of their commitment, the lovers have each other’s names emblazoned on their forearms in matching swirly tattoos. Believing in destiny: Noora says she misses Iraq “very much”, but the welcoming nature of her new neighbours reminds her of the Iraqi sense of hospitality. “I feel like it’s my country, the life here is so easy. Nobody here watches me like I am a refugee.” Migrant numbers at the nearby Tabanovce camp have dropped off sharply since the so-called Balkan route was effectively shut down, although some still cross the region with the help of smugglers. Dejan Kladarin, senior protection officer at the United Nations refugee agency in Skopje, says around 200 people are now in Macedonian transit camps. Noora’s experience “is a nice story and we would like to have more like this... but most of the people are eager to continue” to where there are better economic prospects, Kladarin says. Bobi hopes their romantic tale will encourage other young people to overcome barriers to be with the one they love. “Noora and I want to tell people to believe in yourself and believe in love -- and in destiny. written by Émile Zola about the Dreyfus affair. On Christmas Day 1898, France’s most famous writer, if not the most famous writer in the world at the time, was living in a hotel in Upper Norwood, south London. Émile Zola was the author of a clutch of international bestsellers – Thérèse Raquin, Germinal, La Terre, Nana – but this Christmas he was holed up in a room he hated, unable to speak English, longing to get back to France. How had it come to this? It was only two or three years ago that I pieced together what Zola enthusiasts have known all along: that he was on the run. Early on the morning of 19 July 1898, Zola had stepped off the boat train from Calais, carrying nothing more than a nightshirt wrapped in a newspaper and the name of the Grosvenor Hotel on a bit of paper. The writer who, for me, had been forever fixed in Paris – I imagined him to be a little like Toulouse-Lautrec but more anonymous, creeping around brothels and sewers, interviewing low-lifes and writing their answers in a black leather notebook – had actually spent months in the UK, in hiding from the French authorities. And there was one word that explained everything: Dreyfus. Captain Alfred Dreyfus was an army officer who had been found guilty of espionage on the basis of one document – in French, the bordereau – which supposedly proved that he had leaked information about a gun to the Prussians. He was sentenced to imprisonment on Devil’s Island. Was Dreyfus guilty? One view of this was that of course Dreyfus was guilty: he was Jewish. Another was that Dreyfus was innocent because the bordereau was not written in Dreyfus’s handwriting but in the handwriting of someone else, Major Esterhazy. By this time, the affair was dividing France down the middle: on one side a monarchist, nationalist, Catholic and antisemitic bloc, and on the other, an alliance of Republicans, Protestants, secularists and socialists. 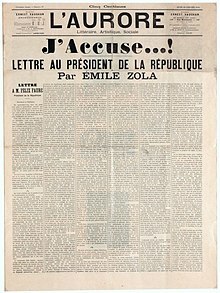 There were probably several reasons why Zola got involved, but the reason Dreyfus’s supporters approached him was that Zola had, in May 1896, written a ground-breaking article “Pour les juifs” (“On behalf of the Jews”). This was an article written against the folly of antisemitism at the height of nation-wide hysteria against Jews. What’s more it was in a sense written against his former self, the author of L’Argent (Money) a novel which had reproduced many antisemitic stereotypes. Zola’s intervention on the pro-Dreyfus side was sensational, if not decisive. He and the editor of the newspaper L’Aurore, Georges Clemençeau, wrote a long article which was headlined “J’Accuse …!” – in truth an open letter to the president of France, Félix Faure, which accused the army top brass of conspiracy and trial-fixing. Zola’s libel was made in the full knowledge that it would be likely to bring down the power of the state on his head, because that was all part of the plan. Finally, the pro-Dreyfus camp thought, all the most recent discoveries proving Dreyfus’s innocence would be heard in court. It was not to be so: the state restricted the evidence to nothing more than Zola’s words, par ordre (“by order of”) – an order that Esterhazy was found innocent only because the court martial had ordered it. Zola was sentenced to a year’s imprisonment and a fine of 3000 francs. Instead of serving time, he had fled and by Christmas had been in England for five months. There is no doubt that the UN Security Council condemnation of Israel on Friday was an important and noteworthy event. True, the United Nations’ main chambers (the Security Council and the General Assembly) and its various institutions, ranging from the International Court of Justice to the UN cultural agency, UNESCO, have repeatedly condemned the Israeli occupation, illegal Jewish settlements and mistreatment of Palestinians. But what makes this particular resolution important? First, the US neither vetoed the resolution nor threatened to use its veto power; nor did it even seriously lobby, as it often does to soften the wording in advance. Second, it is the first decisive and clear condemnation of Israel by the UN Security Council in nearly eight years – almost the entirety of President Barack Obama’s terms in office. Doubtless, the UN resolution – like all others – remains rather symbolic as long as there are no practical mechanisms to ensure the enforcement of international law. Not only will Israel not respect the United Nations’ will but is, in fact, already accelerating its settlement activities in the Jerusalem area, in defiance of that will. The Jerusalem municipality had announced that 300 housing units will be built in the illegal settlements of Ramat Shlomo, Ramot, and Bit Hanina while the Security Council members were preparing for the vote on the “legal invalidity” of the Jewish settlements. The Palestinian National Authority, on the other hand, is already celebrating another symbolic “victory”, which is readily being marketed to unamused Palestinians as a major step towards their freedom and their independent state. The UN resolution was, indeed, keen on ensuring the two-state illusion is perpetuated further, which is all that the leadership of Mahmoud Abbas has needed to continue to push for an unattainable mirage. With all this in mind, there is a lesson – and a valuable one – that must be registered at this moment: without US backing, Israel, with all of its might, is quite vulnerable and isolated in the international arena. The outcome of the vote was quite telling: 14 Security Council members voted “yes”, while the US abstained. The vote was followed by a rare sight at such meetings, a sustained applause, where countries that hardly agree on much, agreed full-heartedly on the justness of Palestinian aspirations and the rejection of Israeli practices. Think about this for a moment: the relentless efforts by Israel and the US to intimidate, coerce and bribe UN members, so as to sideline the international community from the Israeli-Palestinian conflict, is failing utterly. All it took is a mere US abstention from the vote to expose the still solid international consensus regarding Israel’s illegal actions in Palestine. The next year hardly promises to be any kinder, as the new US administration under Trump exhibits all the signs that suggest US support of Israel will remain steadfast, if not take an even darker turn. Rightly so, as the appointment of pro-settlement hardliner David Friedman as the new US ambassador to Israel carries with it terrifying prospects. Friedman and his ilk have no regard for international law or any respect for US current foreign policy regarding the Israeli occupation, the illegality of the settlements (considered an “obstacle to peace” under various administrations) and is eager to relocate the US embassy from Tel Aviv to Jerusalem. All of this is quite ominous, and the freshly passed resolution should not advance the illusion that things are changing. Nonetheless, there is hope. The resolution is a further affirmation that the international community is unconditionally on the side of Palestinians and, despite all the failures of the past, still advocates the respect of international law. This reminder takes place at a time when the Boycott, Divestment and Sanctions (BDS) movement is moving from strength to strength, galvanizing civil societies, campuses and trade unions all over the world to take a stance against the Israeli occupation. Israel can be blamed for much, but Palestinians deserve much of the blame, too, for their own disunity, infighting and corruption. They must not expect their efforts, however sincere, to yield freedom and liberation when they are incapable of forming a united front. This should be done by overhauling the Palestine Liberation Organization (PLO) and bringing all Palestinian factions under one single platform that caters to the aspirations of all Palestinians, at home and in “shattat” (diaspora). The Palestinian leadership needs to understand that the age of ineffectual American leadership is over. No more lip service to peace and handouts to the PA, while bankrolling the Israeli military and backing Israel politically. The next administration is pro-Israeli administration, absolutely. This may be the clarity Palestinians need to understand that begging and pleading for American compassion will not suffice. If a united Palestinian leadership does not seize the opportunity and regain the initiative in 2017, all Palestinians will suffer. It is time to move away from Washington and to embrace the rest of the world. For Polanyi, the problem with this social arrangement was not only that it impeded the democratic process but that it also allowed the interests of the market to assert their primacy over those of society. This happened in Polanyi’s time, during the late 19th and early 20th centuries when laissez-faire liberalism underwrote a violently unequal, predatory global capitalism with few social protections, and it has also happened in ours. Over the past four decades, and often at the behest of various banking interests, center-right and center-left parties throughout much of the North Atlantic have privatized generous stretches of the state and have allowed the logic of the market to pervade almost every aspect of social life. There are now thriving markets for passports and body parts. Cost-benefit analyses determine which departments at a public university get funding and which hospitals, parks, and schools get shuttered. In Polanyi’s time, his main concern focused on how swiftly and dangerously labor, land, and money became “fictitious commodities” and how this despoiled human life and the environment; today, we live in a world in which it seems like almost every social good is capable of being monetized: health, happiness, education, housing, communication, even citizenship have all become commodities sold and purchased on the market. But Polanyi’s Great Transformation was not all dark prophecy; it also offered us some insight into how societies rebelled against this marketization of social life. The free-market economy, Polanyi argued, not only empowered financial elites and commodified social goods; it also created a countermovement in which bodies of people emerged, demanding that the state protect them from the market. In his time, Polanyi believed this could be found in the insurgence of social democratic and socialist politics at the turn of the century, and today as well there are signs of a similar resurgence of social democracy, even socialism, in the party politics and thought of many European and North American countries. These might be indications, however incipient, of what Polanyi called the “double movement” - of society’s tendency to strike back after an age of privatization and economic liberalization - and they may bring back the more radical implications of Polanyi’s argument with them. To search for Polanyi’s intellectual and political roots means coming into contact with a bewilderingly febrile left-wing intellectual milieu that appears to have little bearing on our present. However promising the current moment may seem with a self-described “democratic socialist” coming tantalizingly close to winning the Democratic Party’s presidential nomination, Gareth Dale’s new biography offers us a bracing reminder of a far richer world of socialist activity that once existed in much of the West. Debates over early-20th-century Hungarian socialism; the strategic plans of “Red Vienna”; the reformist 1961 platform of the Soviet Communist Party: These questions obsessed Polanyi and his contemporaries to a degree that seems almost inconceivable now and certainly residing in a sobering distance to our own immediate lives. Polanyi’s political activism and intellectual work were implicated in the widest questions debated on the left. The son of wealthy Hungarian Jews, he emerged as part of the “Great Generation” of Hungarian artists and intellectuals in Budapest at around the turn of the 20th century. John von Neumann, the mathematician, and Béla Bartók, the composer, were his contemporaries; so were the sociologist Karl Mannheim and the Marxist theoretician and literary critic György Lukács. Polanyi’s brother, Michael, became a philosopher of science, who for many years was better known than Karl. … In its critique of 19th-century liberalism, The Great Transformation offers a remarkable amount of insight into how it helped commoditize those parts of human culture that should have remained outside the jurisdiction of the market - in particular, land, labor, and money. Subject to the logic of the market, instead of how the use of these social goods might benefit or harm society, land, labor, and money are transformed into what Polanyi calls “fictitious commodities.” According to the utopian advocates of laissez-faire economics, these goods are better off traded on the open market, but as Polanyi shows in his book, if land, labor, and money are permitted to follow the mechanisms of the market alone, there would be few safeguards to protect their health, leading to significant devastation. This was recognized not only by socialists and critics of the free market but by many liberals who discovered that various attempts at the commodification of these goods resulted in massive social dislocation and upheaval; and so, as Polanyi shows, liberals also turn to the state to ensure that the “self-regulating” market could emerge despite these disruptions. Many of the central elements of this economic system - a “competitive labor market, automatic gold standard, and international free trade” - were far from naturally occurring, and they also required a state to ensure that “self-regulation” didn’t cause too much damage. The free market could not simply come into being on its own; it had to be legislated. Even so, this double movement didn’t result in the erection of a true welfare state or the kind of social democracy that Polanyi championed. He believed this was because the architects of economic policy were concerned only with keeping the social fabric from fraying irrevocably, not with finding ways to actually reassert society’s power over the market. This refusal to fully embrace a more robust social-democratic model was also why so many policy-makers resisted taking their countries off the gold standard (Franklin Roosevelt being a notable exception): It robbed them of the ability to induce the threat of a run on the currency and to maintain both their own and the market’s supremacy over public-policy matters. But the place where Polanyi ended - a vision of a socialist and social-democratic state pushing back against the commodification of social goods - is one that leaves us with the dilemma we still face. Many of the attempts to reform the market economy have foundered or been countered by right-wing retrenchment. The Bernie Sanders and Jeremy Corbyn phenomena aside, social democracy is hardly thriving; most of its parties are in disarray, challenged on both the insurgent left and the revanchist right. What appears presently to be in crisis is liberalism itself, with violent, ugly solutions proffered by neofascists across the globe. Sheldon Wolin - Can capitalism and democracy co-exist? Is there such a thing as ethical capitalism? George Monbiot: Ayn Rand - A Manifesto for psychopaths..
George Monbiot - Growth: the destructive god ..